USGS Open-File Report 2005-1332, 17 p., 6 figs. Ingersoll, G.P., Mast, M.A., Nanus, Leora, Manthorne, D.J., Handran, H.H., Hulstrand, D.M., and Winterringer, Jesse, 2005, Rocky Mountain Snowpack Chemistry at Selected Sites, 2003: U.S. Geological Survey Open-File Report 2005-1332, 17 p.
Chemical composition of the Rocky Mountain snowpack during water year 2003 was determined from samples collected at 74 sites extending from New Mexico to Montana. Snow samples were collected near the end of the 2003 snowfall season from a snowpack that was below average in every sampled basin but one, based on March 1 snow-water equivalent data. Significant snowfall during March increased snow-water equivalent values to near-average or greater in some basins, but for most of the basins below-average snow-water equivalent values on April 1 indicated that the region-wide drought continued. Regional patterns in the concentraations of major ions including ammonium, nitrate, sulfate, mercury, and the stable sulfur-34 isotope (δ34S) differed from the previous year, 2002, which was affected by more severe drought conditions. 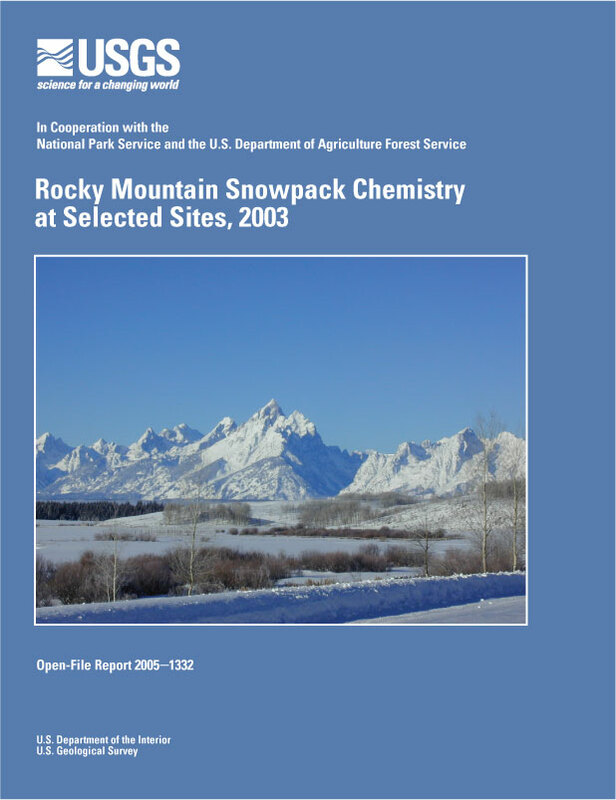 At sites reported during both water years 2002-03, snowpack ammonium concentrations for 2003 were higher than concentrations in 2002 at most sites in the region. Nitrate concentrations were lower in 2003 than in 2002 at nearly all network sites, particularly at sites in Colorado and New Mexico. Sulfate increased across the region at about one-half of the sites reported for both years, whereas mercury concentrations decreased at slightly more than one-half of the sites in 2003. Ratios of δ34S exhibited a similar regional pattern as observed in 2002 with ratios generally increasing northward from New Mexico and southern Colorado to northern Colorado, Wyoming, Idaho, and Montana.